Neither the minister nor the unions will budge. 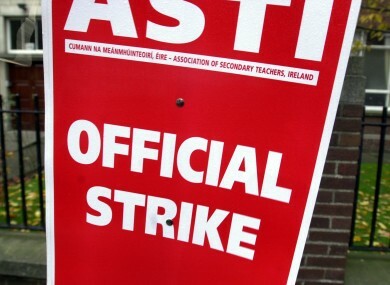 WITH LESS THAN 24 hours to go, the dispute between the government and teachers over reforms to the junior cycle shows no signs of being resolved meaning secondary teachers will go on strike tomorrow. Some 350,000 secondary school students will be affected as teachers protest changes to the junior cycle programme that would oblige them to mark 40 per cent of their own students’ work. The two sides have been at an impasse since unions rejected compromises put forward by O’Sullivan last month, saying the ‘internal assessment’ model proposed would not be workable. Under the Minister’s revised plan, teachers would have to assess 40 per cent of a student’s work in awarding a grade, but a third-year exam would still account for 60 per cent of a grade. O’Sullivan’s predecessor Ruairí Quinn had previously proposed that teachers assess 100 per cent of their own student’s work as part of radical reforms to the junior cert. Speaking to reporters in Limerick earlier, O’Sullivan said she was open to talks, but that any discussions were down to the unions involved, the TUI and ASTI. “Really I believe the ball is in the court of the unions now. I believe that they should come back to the table,” she said. Despite her willingness, O’Sullivan said she had been given no indication that talks are pending. Speaking to the News at One on RTÉ Radio a short time ago, Phillip Irwin from the ASTI said his members’ position was that the external assessment of junior cycle students is “better, safer and more professional”. “We are open to talks but she [O'Sullivan] has said on the basis of this offer she has made and that’s the impediment,” he said. He said that external assessment “is a very important quality control for the system”. On the disruption that will be caused by tomorrow’ strike action, Irwin said he believed it would “bring it to a head”. “Finally we might be taken seriously and finally we might get a solution,” he added. Email “Teachers are almost certainly going on strike tomorrow ”. Feedback on “Teachers are almost certainly going on strike tomorrow ”.